Anthony Koh Waugh (photo above, right) is a bit of a legend in the local book trade. 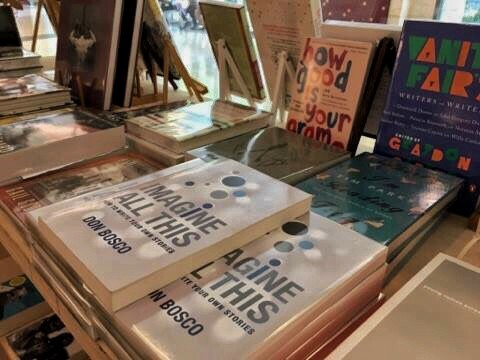 Over the past few years, he has taken his Booktique bookselling brand from passion project to retail experiment to, currently, a downtown shopping sanctuary where book lovers can expect to be swept away by the rather delightful and surprising selection of titles. 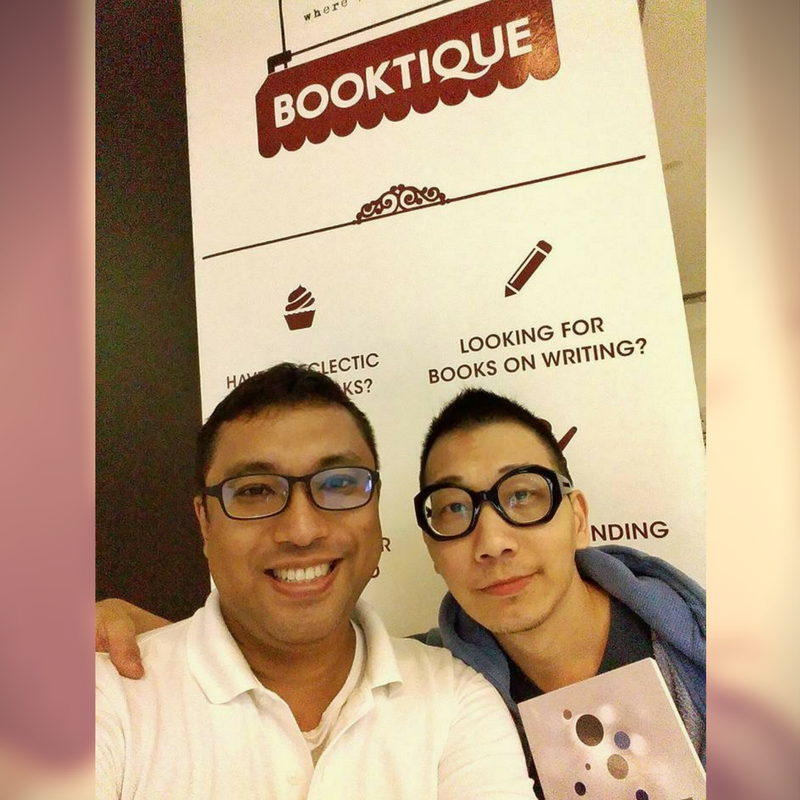 Here’s an interview with the man himself, about his passion for local writing and why he wants Booktique to evolve further. Do drop by to experience the space for yourself, the address is at the end of the interview. Please introduce yourself and your bookstore. I was writing for magazines before I founded Booktique ~ Where Writers Shop in 2013. We started with a year of book fairs at various sponsored venues before venturing into retail space. Our first physical store was a three-months’ tenure at The Cathay. After that, we moved into CityLink Mall, our permanent “home”. Booktique is very different from other bookstores. Some walk-in customers have asked if they could buy the books. They thought it was an exhibition space because we have more space than bookshelves. Now and then, we still get questions like “what’s so special about your bookshop?” If you haven’t visited us, I hope I have piqued your curiosity to drop by soon. Running a bookstore is quite a challenge, what are the joys that keep you inspired? I’m used to challenges. I was a full-time freelance writer for 7 years. Technically, it was a business albeit home-based. I pitched stories to magazine editors, marketed my writing services and invoiced my clients. Bills always arrived on time but never my pay checks. These challenges are similar to my retail business except that the bills are bigger now. The joy of having my own bookstore is being able to keep buying books without feeling guilty. And when customers like our books and are inspired by my founding story, I feel motivated to do my job better. I don’t see bookstores as just another retail store; I regard them as a cultural business. They are the catchments of local literary works – past and present, especially the independent ones. They are places where Singaporeans can buy and own Singapore literature. And I believe this makes a huge difference as opposed to borrowing them from libraries. I couldn’t imagine the impact on our literary scene as I read that bookstores were closing down one after another. That was partly why I had decided to open a bookstore. You’ve been supporting self-published authors. What advice do you have for those who want to explore this? I strongly advise all self-published authors to hire a qualified editor and invest in a good cover designer. If your cover looks unattractive on the shelf, your book has no chance of being picked up. And if you’re writing a memoir, please don’t put your face on the cover unless you are a public figure. Print on demand won’t grow your brand as an author; print a few hundred copies. For some self-published authors, big bookshops may not be the best place to sell your book. You are competing for attention with thousands of books. When people don’t know you, you cannot be hidden somewhere on the shelves. Depending on what you write about, some other venues might be better to get you the visibility and sales. What are your plans for Booktique, and how can local writers get involved? By June 2017, Booktique will be 4 and 1/2 years old. The media and literary circles are already familiar with who we are and what we do. So it is time to move on to a different brand. I have a few concepts in mind but nothing is definite yet. Right now, I just want to ride out the retail storm. So follow us on Facebook closely after June to get updates of our next bookstore. Booktique ~ Where Writers Shop is at:﻿CityLink Mall #B1–17A , 1 Raffles Link, Singapore 039393. NOTE: Get a special launch discount on my new book IMAGINE ALL THIS: HOW TO WRITE YOUR OWN STORIES, only at Booktique. Offer ends 12 November 2016.